Before we get any further in the series of Embroidery Archeology articles that cover salvaging ecclesiastical embroidery for re-use, I thought I’d set up an organizational structure for the series to make it easy to reference. If you’re relatively new to Needle ‘n Thread, under the main menu on the website, you’ll find a section called Tips & Techniques. In that section, there’s a list right at the top of indexes for all kinds of series of articles here on Needle ‘n Thread. You’ll find projects that evolve step-by-step, as well as collections of lessons and tutorials. 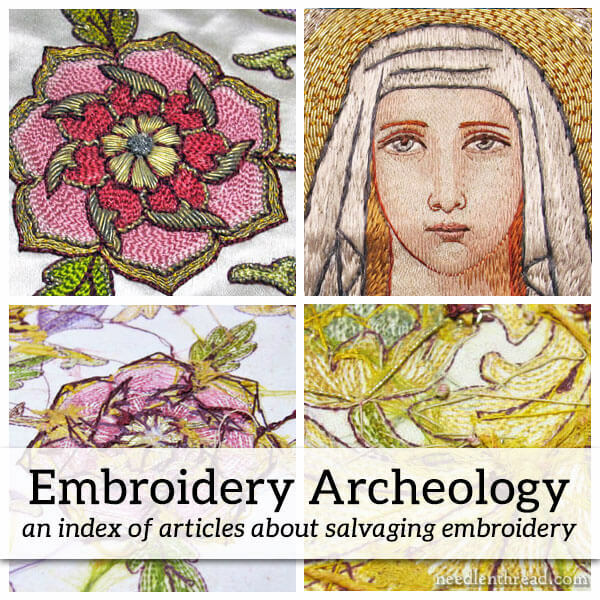 This particular index for all the articles in this series on Embroidery Archeology can be found on that list, and each time I publish a new article on the topic, I’ll add it to the list below in chronological order from first to last in the series. This way, you can follow along at your leisure and refer back to the index whenever you need it. In this series of articles, I’m taking apart an old piece of ecclesiastical embroidery to salvage the figures (and any other parts I reasonably can, but the focus is the figures) and replacing them on new ground fabric so that they can be used. This is a bespoke project, but it doesn’t have a specific deadline at this point. I’ll share progress on the project as I make headway with it! Visual Documentation and Close Examination – making scans of the original embroidery for the record! As the project progresses, I’ll add the articles to this list, which you will find on Needle ‘n Thread under Tips & Techniques. Feel free to bookmark it and share it with any of your stitching buddies who might have an interest! You can find a similar project called Deconstructing Goldwork here, where I took apart an old piece of goldwork embroidery. This Mission Rose embroidery project was inspired by an old piece of ecclesiastical embroidery originally done in chain stitch, that I examined, eventually traced, and then developed into a new pattern and embroidered it in silk and gold. Thanks for sharing Embroidery Archaeology Index and for the links to other embroidery indexes in Tips and Techniques. Thanks for the new list. Only thing not here that I can never find are those Get a cuppa round up articles! I bet a lot of work went into this list! Kind of an archeology project all on it’s own..3102 blog posts later! Thank you so much for this article. I find checking the indices against my bookmarks very helpful. I’ve checked the list here against my bookmarks but I’m not seeing the list under Tips and Techniques yet. The list you have given here about the old goldwork allowed me to find out that I had missed the article about Further Explorations of Old Goldwork. Thank you again for this site and the organisation you have done to make it helpful to readers. Hi Mary, thank you so much for this invaluable information. One thing, though, the link called “Machine or Tambour Work? The back of the Embroidery” goes nowhere… I would love to see it! Thanks so much for letting me know, Liz! I just fixed it – not sure what happened there!